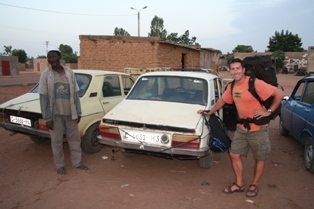 We arrived in Segou, 230K east of Bamako, with relative ease. No delays; and a nice breeze running through the us all the way. The journey itself was interesting. We were on the one tarred road winding east; all others were of red dirt. We passed mud villages, fields of watermelons (they grow on surprisingly small plants), ancient cars, and roadside mosques consisting of four low walls and some mats. 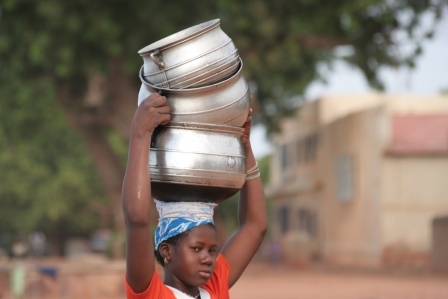 Ségou is a calm town on the banks of the great Niger River. It has remnants of buildings from colonial times, but once you leave the small commercial centre, most buildings are made of mud. 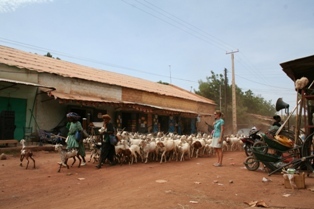 Everyone is very friendly, though the local languages are spoken between themselves, most have some French. ‘Guides’ present themselves from all sides, they can be hard to shake off, though apparently their approaches are relatively mild here! Everything works on a local basis here. We saw cloth being woven on wooden looms, that cloth being sold at the markets, and tailors working away on old Singer machines in dark rooms. Petrol is sold by the litre from old Ricard bottles, donkey and cart is the main mode of transport. There is little running water or electricity. We bought slices of watermelon, and locals laughted when we were instinctively looking around for a bin for the rind! 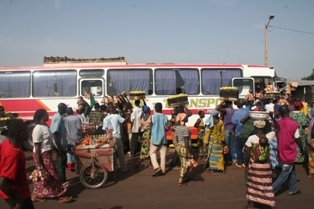 There is much street food on offer, favourites seem to be fried potato slices, fried fish sandwiches and roast cashews. 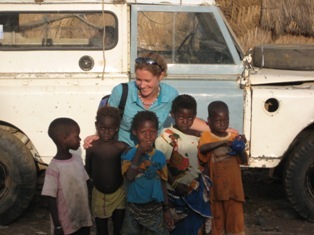 We took a trip accross the Niger to a small fishing village called Kala, on a public pinasse. 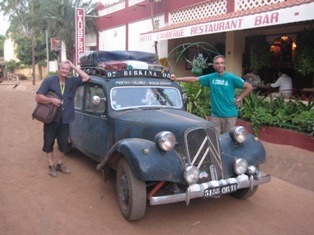 We met two Frenchmen on said trip – Over a beer later, it transpired they had travelled down from France in a 1955 Citroen! Cathal went a bit green for the want of real adventure…we passed an enjoyable evening with them hearing all their stories of trips done over the years, including a trip accross Oz in the same car. They were bit like a ‘road’ version of Paddy Barry and co! We stayed three nights in the Hotel Djoliba, possibly the nicest place we have stayed in our trip so far. We would recommend it to anyone passing through. 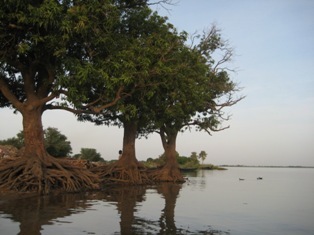 Our time was for the most part very relaxing, we got a flavour of riverside town life, tasted the local speciality of Capitaine a la Bamakoise (Nile Perch served with fried banana and a tomato sauce), heard our first West African music at a locals bar, and tried to adjust to the soaring daytime temperatures!! Certainly well off the beaten track – fascinating; I wonder what the natives are thinking – you are obviously meeting up with other ‘non-nationals’ so they must be somewhat accustomed to while faces.